McCulloch House, a designated Nova Scotian heritage site, was built in 1806 for Dr Thomas McCulloch, a prominent educator, writer and minister. Constructed of bricks sent from Scotland, it is commonly referred to as being of "Scottish domestic" design. Originally the line of the roof was a gable. However, many exterior and interior features of the house remain unchanged. The carvings of the white pine interior wood trim are attributed to George McCulloch, a brother to Thomas, who spent his later years in Pictou. Dr McCulloch called his home "Sherbrooke Cottage" as a tribute to Sir John Sherbrooke, a Lieutenant-Governor of Nova Scotia who had been sympathetic to the development of Pictou Academy. 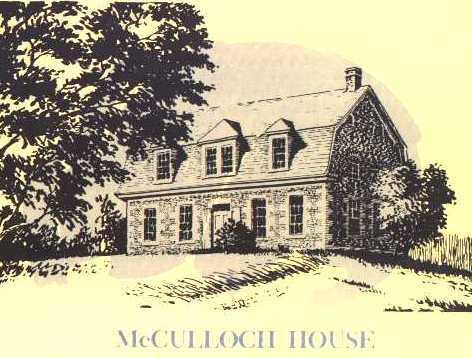 Since 1943, McCulloch House has been the home of the Murdoch MacCuish family. It was purchased by the province of Nova Scotia in 1972 for preservation as an historic house. Mrs MacCuish remained in residence for many years and the house together with its extensive geneaological archives and library are administered on behalf of the province by the Hector Centre Trust.